BitKong brings a bit of the old familiar feel of simple Bitcoin gambling and peppers it with some unique bonuses. Addictive as it claims. Straightforward, hassle-free payments, anonymous provably fair play, multiple faucet and wager bonuses, interest-bearing savings. Only one game, minimum deposit and withdrawal slightly on the high side, lack of chance/payout variety. It’s a jungle out there. Literally, at least when depending on visual and aural sense. Visit BitKong and the first two things you’ll notice are the gorilla’s intimidating face staring back at you and the sounds of the tropical jungle piping as background music. 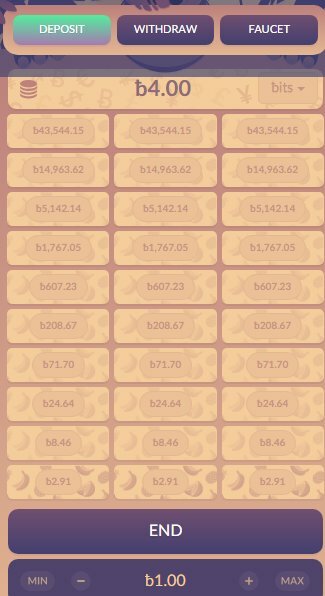 Fans of Bitcoin dice games will appreciate the utter simplicity of the website, with everything you need to see accessible on the main page: game window in the centre, statistics on the left and a “Hall of Heroes” on the right to help motivate you to win leaderboard bonuses. With a significant following that continues to grow since its launch in 2015, there’s little to doubt about BitKong being “The most addictive Bitcoin game ever”. BitKong features anonymous play, meaning your username is created as soon as you land on the page and you can deposit to play rightaway. But if you don’t feel safe playing this way (if you lose your cookies or your private url before withdrawal, you’re caught out for example), you’re welcome to register by logging in with your Facebook account. You play a game first by choosing either Easy, Medium or Hard on a sort of ladder-like structure. You can click one of several columns in each row or “rung”. Guess right and you win the corresponding amount of Bitcoins. Each correct guess, you can cashout or try to go one rung higher to achieve exponentially bigger wins. The higher the difficulty, the lower the chances of you guessing the right column in each “rung”, the higher the payouts on each higher rung. On Easy, there are 2/3 correct columns, on Medium, 1/2 and on Hard, 1/3. The minimum deposit at BitKong is 4,000 bits (400,000 satoshi or 0.004 BTC). Games are played in denominations of bits. You can choose to deposit less than the minimum but you’ll be charged 500 bits as commission. The same minimums apply to withdrawals, with a flat 500 bit fee charged as commission. You can only withdraw once all deposits have been confirmed at least twice. Large withdrawals will be processed manually from 10:00 to 18:00 GMT on business days, although it is unclear what amount would qualify as a large withdrawal. We understand that withdrawals as large as 0.5 BTC are still processed automatically. Like gambling a lot? You’re in luck. BitKong features generous bonuses every day, giving away 56,000 bits to the top 10 highest wagerers. Top 10 weekly wagerers share a prize pool of 560,000 bits while the 10 players who wager the most each month share 2 BTC! 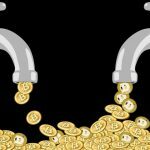 There’s a free 5 bit faucet which you can claim every 20 minutes if you have less than 1 bit in your balance. Login with Facebook, reach “Hero” level and the waiting period reduces to 10 minutes. During random Funky Hours, you may claim 25 bits 6 times. Fridays to Sundays, the faucet fattens up with 15 bits every 10 minutes. If you don’t want to wait, you can buy faucet packages: 3,000 bits will buy you 200×20 bit claims, 7,000 bits will get 500×20 bit claims and 12,000 will get you 1,000 claims! Want to hoard your winnings? Deposit at least 10,000 bits in BitKong savings and you’ll earn 8% interest annually. If anyone needs a lesson on how to make a quirky, simple, yet addictive game, there’s a lot of lessons to be learnt from BitKong. Intuitive gameplay, respectable free bets to try out the game, a lucrative prize pool for loyal players, and even an interest-earning savings account, this is a Bitcoin gambling site you don’t want to miss out on.